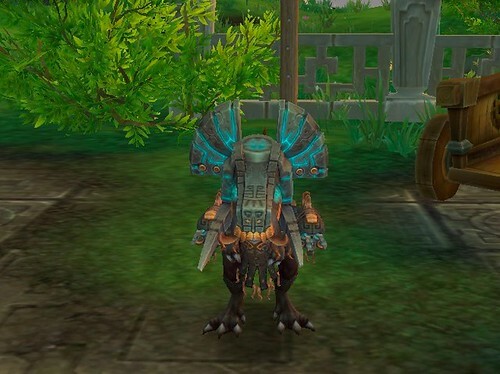 For a pet battle fan, there are three things to do on the Timeless Isle: capture new pets, Celestial Tournament, and Lil' Oondasta. The first is easy, the second is complex, and the third is a piece of cake with the right team. Before attempting to defeat Lil' Oondasta, I did a bit of research, put together a team touted as 100% win, and got beaten soundly every time. I read some more, thought about what actually was happening, switched out a pet, and started winning. I can't call it a 100% win team, because once the RNG was rolling so against me that I lost. It happens, chance is chance. I didn't even get upset, because it was so ridiculous to miss with nearly everything. Of course, Lil' Oondasta critted more than usual that fight as well. So, I'm calling it a 99.9999999% win team. - Call Lightning > Clockwork Gnome gets switched in. - Build Turret > Metal Fist until dead or you can build another turret > Metal Fist until dead. - Choose Darkmoon Zeppelin if Sunreaver Micro-Sentry is not dead yet, otherwise it gets chosen automatically. - Decoy > Missile until Lil' Oondasta dies. You can use Explode if Sunreaver Micro-Sentry is still alive when Lil' Oondasta has less than 615 health left. The strategy here is to apply the weather effect Lightning Storm, and then have the Clockwork Gnome be the pet switched in by the Frill Blast. You want the turret + the lightning storm to do damage to Lil' Oondasta as many rounds as possible. If you can build two turrets, the damage adds up to lots. Sunreaver Micro-Sentry is there to only apply the Lightning Storm, you can use any pet with that ability. However, it should go first, or Frill Blast will switch your pet out before it can cast. The third pet can be any pet with a mechanical attack and an avoidance ability, that has just a little less health than Clockwork Gnome because you want the gnome to be the pet that Lil' Oondasta switches in.